Last week, my husband pulled something in his back, so we bought a huge bag of frozen peas to ice it with. His pain has since passed, but the monster bag of peas is still here. I have to confess, I don’t really like peas—they are just kind of blah, so I was stumped with figuring out a good way to use them. 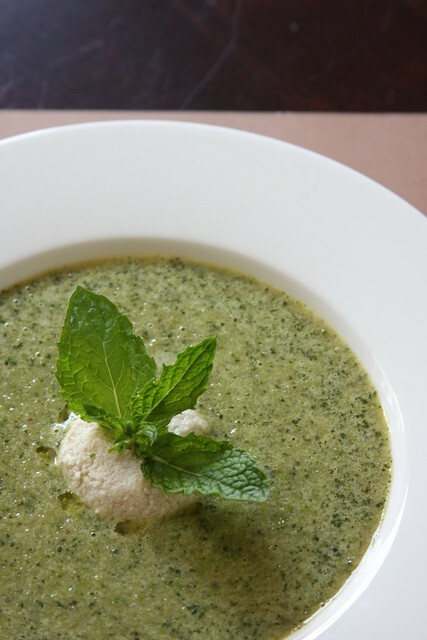 When I spotted some fresh mint at Whole Foods this weekend, I decided that some minted pea soup would be perfect. Served at room temperature, this is a light yet flavorful summer dinner. First, make the cashew cream by combining all of the ingredients together. Set aside. Melt the Earth Balance in a soup pot over medium heat. Add in the onions and sprinkle with the salt. Cover and steam for about 4 minutes. Add in the frozen peas, stir well and cover for about 4 more minutes. Add the broth and bouillon cube to the pot and simmer for about 10 minutes more, uncovered. Remove from the heat and add in the fresh mint and basil oil. Using an immersion blender or a blender, puree until very smooth. Serve at room temperature, topping with the cashew cream and extra basil oil. this salad looks so yummy! i love minted pea soup! Sounds so light and refreshing, perfect in this heat!! I must get round to making some cashew cream, I keep seeing recipes I want to try !! So…I have quite a bit of catching up to do in my little Erin experiments:) These past couple weeks in Okinawa, the temperature has dropped dramatically (for us–this means blustery 70's) with back to back typhoons that have either hit us directly, or swept the perimeters of the island with wind and rain. This makes me crave comfort foods like warm soups. I have made a few this week alongside fresh baked French breads. This soup is what I made last night. This is the second time I have tried one of your recipes containing peas (the first, your scallops) and I was surprised and delighted. Peas do not usually appeal to me, possibly because I have a bit of an exotic palate and peas remind me of a simple side of vegetables on a typical American plate. I now have a whole new view on peas. The mint added such a subtle freshness and the cashew cream lent to its rich depth and dimensions. I always know it is a hit when my meat eating family loves it too. I served with your new vegan tuna salad sandwiches. Delish! This recipe is incredible and that cashew cream is the best I’ve ever made or had. I made this for my dude and my mom and they really liked it (especially my mom, who practically begged for the recipe. Neither one of them are vegan). Thank you for making the best recipes.